"It's like he's determined to remain completely unsatisfied." Vertigo has unveiled an official UK trailer for the film Final Portrait, an intriguing look at the work of acclaimed Swiss artist Alberto Giacometti. The film stars Geoffrey Rush as Giacometti, an eccentric painter and sculptor who lived in Paris for the the last years of his life. The story is all about his friendship with an American journalist named James Lord, played by Armie Hammer, who visited in the 1960s. Giacometti asked Lord to sit down for a portrait, to be finished in only a few days, but it ends up going on and on for months - his final portrait. Also starring Clémence Poésy and Tony Shalhoub. I saw this film at the Berlin Film Festival and wrote in my review that: "Rush gives such an outstanding performance, it's compelling and thoroughly enjoyable to watch him." In 1964, while on a short trip to Paris, the American writer and art-lover James Lord (Armie Hammer) is asked by his friend, the world-renowned artist Alberto Giacometti (Geoffrey Rush), to sit for a portrait. The process, Giacometti assures Lord, will take only a few days. Flattered and intrigued, Lord agrees. 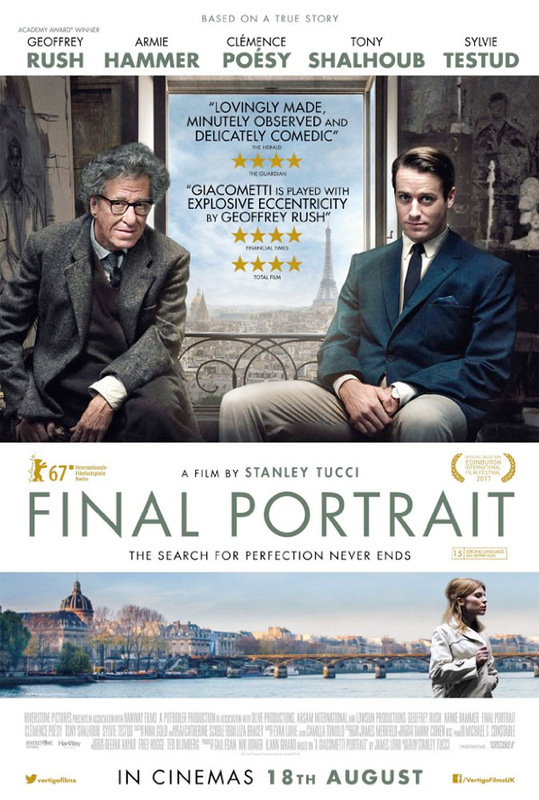 Final Portrait is both written and directed by American actor-director Stanley Tucci, who has previously directed the films Big Night, The Impostors, Joe Gould's Secret, and Blind Date (along with an incredible acting career). This first premiered at the Berlin Film Festival earlier this year (read our review) and also played at the Sydney, Edinburgh and New Zealand Film Festivals. The film opens in UK cinemas starting this August, but doesn't have an official US release date set yet. Stay tuned for updates. What do you think?